I cannot believe how quickly October has flown by. I say this every single month, however the year is wizzing by and it's very nearly Christmas, can you believe it? October was an okay month, I wouldn't say is was absolutely amazing, but I wouldn't say it was absolutely terrible either, it was just okay. University isn't that great right now. My lecturers are paid to teach, however they're not teaching nor supporting us. Don't you worry, I have mentioned this to the top dogs so they can do something about it and hopefully they will! (My fingers are crossed). There isn't a lot going on throughout November and to be honest I'm fairly happy about that as maybe I'll be less anxious and stressed, but we shall see! For the past few years I haven't been to a fireworks display and this year I am determined to at least go to one, possibly two! I love a good fireworks display with lots of fireworks, a large bonfire and the traditional bonfire night snacks which you can find on stalls. Although I hate the idiots who have their own fireworks display in their back garden at 11pm, the village displays aren't too bad. I like dark mornings, but I don't love them! However, now the clocks have gone back the evenings are going to be a lot darker and I am so excited for this! Feeling cosy with fluffy socks and a soft pair of pyjamas with lots of blankets is what every person needs on a cold Autumn evening. Obviously, I can't forget a big mug of hot chocolate with squirty cream and mini marshmallows! I'm looking forward to finding new series on Netflix too! It is a month and twenty four days till christmas meaning it's time to start the Christmas shopping, listening to the Christmas songs and wrapping presents! I absolutely love the build up to Christmas, compared to Christmas Day itself and I'm glad it's finally November so I can start feeling more festive! Let me know what your favourite thing is about Christmas! Mine is wrapping presents! My main goal for November is to pass my university presentations. My lecturers are not teaching or supporting us so to be able to pass two presentations will make me feel so happy. Also last year I had no worries about passing, this year I am 1000% stressing about whether I'm going to pass my modules or not due to the lack of support we're receiving. I think I let absolutely every little thing get to me in October, I was an emotional mess for most of the month! So my second goal for November is to not let anything get to me and I mean nothing! I want to stop stressing about the little situations which aren't worth stressing over! I'm making myself miserable over something which might not even happen, it's pointless! If i can get through November without letting something get to me, I will feel so proud of myself! This goal is very similar to the one above and I don't really need to speak about this in-depth as it's simple. I want to feel happier and be happier! Happier with my life, happier in myself, happier with what's going on currently and to feel happier about my body. I will achieve this, and I will do everything I can to achieve this. I couldn't write my goals without mentioning a blog related goal! My goal for twitter this month is to reach 3000 followers! I am very very close to this goal, but to achieve it will be an incredible feeling! You can find me on twitter here. I love the build up to Christmas as much as I did when I was a child! Hope you achieve all your goals! i love this! i'm so excited for the run-up to christmas, i have so many DIYs and recipes coming up! 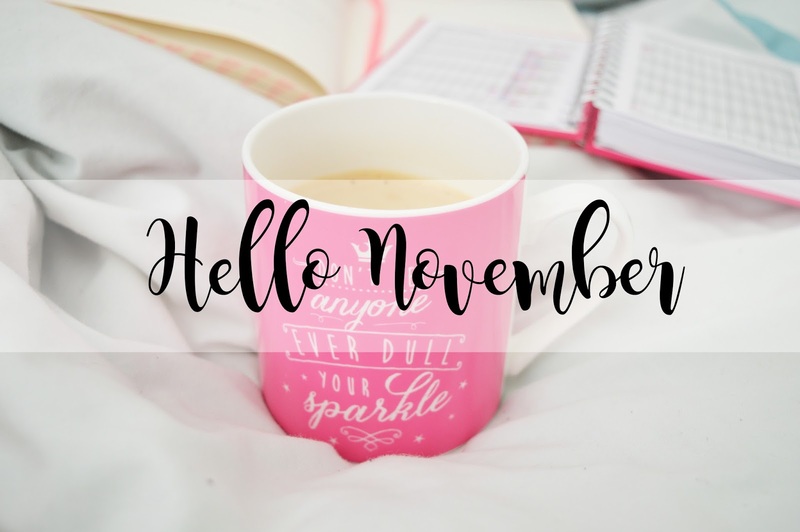 I hope you have a good November! Seems like we have the same favorite things about November! Firework night is the best!!!! I love goal posts and seeing what you're aiming for! Fab post and good luck! Good luck with your goals this month! I'm excited for it to get darker and colder too! But hopefully not too cold haha. I agree with you about neighbours setting off fireworks late, it's so annoying!